Main Street Monday — Will Online Small Biz Lenders be able to Disrupt the Marketplace after the Regulators Weigh in? I’m in New York today to find out. And, given the miserable 90 degree, 60% humidity weather here, I better get some answers for my efforts. 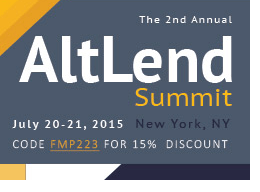 This is the second year of the AltLend Summit — an event for innovative, marketplace online small b usiness lenders. The major question posed by the event organizer is also faced by brick and mortar lenders. What will regulation do to the small business lending industry? Alternative lenders are concerned, in fact much more so, about regulation than brick and mortar lenders. Brick and mortar have a glimpse into the future of such regulation with data collection requirements — alternative lenders may be regulated out of business. And that is what I am talking about Tuesday morning — can this industry become transparent, quickly, or will the CFPB come down hard on them like they have their payday loan cousins? p.s. No so dirty little secret. A number of those payday consumer lenders who have been severely hampered with regulations, are here to try to migrate to the unregulated, Wild Wild West of small business lending.